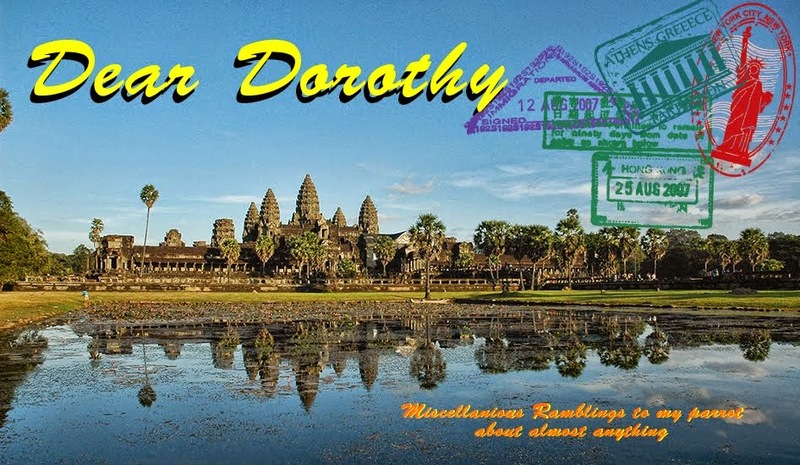 Dear Dorothy: What's in a name ? I finally packed everything I think I need for the trip, then removed a few pounds of clothing from my luggage. I can think of a few things I forgot but nothing major. My friend Tiffany drove me to the bus that leaves town and goes directly to SeaTac. It’s pretty convenient and a bargain over the prices that the lots around the airport charge. Three hours of watching western Washington roll past. A totally different experience from driving that familiar route. For one I got to look at the scenery instead of the road. That was a real treat. I even saw a few things along the way I hadn’t noticed in 40 years. Also the bus put me way, way up. Got to look over the freeway shrubbery and down into the passing cars. Lots of people texting while driving, one or two driving with their knees, but nothing juicy to view. Maybe on the way home. Since tomorrow is about 22 or 23 hours in the air, not to mention TSA and check in and all the other stuff flying requires, I booked a hotel for the night. I wanted to be fresh at the start at least. When I got to the hotel the woman at the front desk could not find my Booking.com reservation. She searched, read my confirmation email and still was unable to find it. Finally I said “Try Dorothy Macaw” and in two seconds I had a room. Steve Wozniak on of the founders of Apple Computers went back to college to finish his degree after Apple was founded. He knew that if he used his name he wouldn’t be anonymous. Instead he took his dog’’s name and his wife’s maiden name and went back to school as Rocky Hughes. When I set up an account for Booking.com, I used the first name Dorothy, and the last name Macaw. Using Steve’s example. Dorothy is a Macaw so she would be Dorothy Macaw I guess. Anyway I am now sleeping in a room in my parrot’s name. After a dinner of good food and non existent service I came back to the room and settled in for the night. Tomorrow the first plane, to Atlanta, leaves about 10:30 am. Since the airport is just minutes away I should have time to get ready at a leisurely pace. A plane change in Atlanta and then the direct flight to Johannesburg. It is going to be a long day and I’m already dreading it. Can't wait to read up on this adventure! and the sarcasm, my favorite!